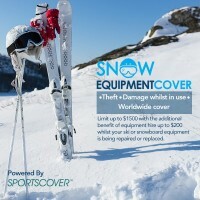 Ski & Snowboard Australia and Snowracer , in conjunction with Sportscover , are pleased to introduce Snow Equipment Cover . Snow Equipment Cover provides insurance for your most important snow going asset, your equipment. Snow Equipment Cover provides insurance against theft and/or damage to ski's, snowboard, boots, bindings etc both domestically and internationally from the date of purchase through to April 2019. Whether you work in the snow, ski/board just for fun or compete at any level, Snow Equipment Cover is available to you. Simply log in or sign up (free of charge) as a Snowracer member and follow the prompts. Current Snowracers can purchase cover by clicking here. If you are not a Snowracer you can register for FREE and purchase your insurance here .